Janet and Reynolds Stone, both distinguished personalities in their own right, occupied The Old Rectory in Litton Cheney from 1953 until Reynold’s death in 1979. Reynolds Stone was a notable engraver and typographer, Janet an accomplished photographer. REYNOLDS STONE Reynolds Stone was born at Eton on March 13 1909, where both his father and grandfather were house masters. He read history at Magdalene College Cambridge. After taking his degree in 1930 he became an unofficial apprentice at the Cambridge University Press under Walter Lewis. Encouraged there by Mr Nobbs, the press overseer, he began experimenting with engraving on metal and wood. A chance meeting on a train from London to Cambridge with Eric Gill, (Stone was carrying four sheets of Gill’s lettering bought at the V & A), resulted in an invitation to stay at Gill’s house at Pigotts. He left after two weeks having engraved an alphabet under Gill's supervision, who felt that at this point he had nothing further to teach him. He moved to Taunton to work at the printing firm of Barnicott and Pearce. During this time he engraved his first bookplate; other commissions followed, which allowed him to leave Barnicott and Pearce and became an engraver full time. Among many commissions he engraved his first Royal bookplate for Elizabeth of York (the Queen Mother) and engraved headings for the Nonesuch Shakespeare. In 1937 he was commissioned to engrave the Royal Arms for the Order of Service for the Coronation of King George VI, (he had already engraved a bookplate for the then Princess Elizabeth), to be printed at Cambridge, but possessors of the first edition of this most handsome document, designed by Stanley Morrison, will not find Stone’s engraving in it - he was late and Walter Lewis finally refused to wait any longer and went to press with a previous and much inferior design! However, the soon-ordered reprint contained Stone’s engraving. He married Janet Woods in 1938, and moved to Bucklebury, Berkshire. At this time he illustrated Rousseau’s 'Confessions' for the Nonesuch Press and 'The Praise and Happinesse of the Countrie-Life' for the Gregynog Press. In 1939 he taught himself to cut letters in stone and, when commissions for memorial and other tablets increased, he took on and trained assistants, one of whom, Michael Harvey, became a distinguished letterer in his own right. During the Second World War he worked as an aerial photographic interpreter for the RAF, and continued to engrave. In 1953 they moved to The Old Rectory at Litton Cheney in Dorset, which was to be his home for the rest of his life. The garden and surrounding landscape proved to be a fertile source of inspiration for his painting and engraving. Reynolds engraved the clock device, the court circular, and Royal Arms headings for The Times newspaper. He engraved the Royal Arms for the coronation of Queen Elizabeth II, and the official Coat of Arms for HMSO still seen on all official documents, including the British Passport. He engraved hundreds of bookplates (including Benjamin Britten and Peter Pears and the Prince of Wales), often with characteristic and elegant Italianate swirls and flourishes. He designed the 3d Victory Stamp (1946), the £5 (1962) and £10 notes (1964) which were in use until decimalisation. He cut many important memorials in stone and slate, including those for Winston Churchill, Ralph Vaughan Williams and T S Eliot in Westminster Abbey. He had several exhibitions, both through the Arts Council, notably in Aldeburgh in 1958, and at private galleries. Among the many books he illustrated were 'Apostate' (Forrest Reid), 'The Open Air' (Adrian Bell), and 'Omoo' (Herman Melville); uniquely, Sylvia Townsend Warner illustrated his engravings with poetry in 'Boxwood'. 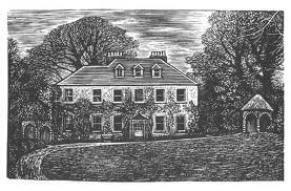 His magnum opus is perhaps the set of engravings, 'The Old Rectory', which was published in 1976 by Warren Editions. Among his last works were engraved illustrations for 'A Year of Birds', with poems by Iris Murdoch, published by the Compton Press. He was awarded the CBE in 1953, and was made an RDI (Royal Designer for Industry) in 1956. He died on June 23 1979. “Good art shows us reality, which we too rarely see because it is veiled by our selfish cares, anxiety, vanity, pretension. Reynolds as artist, and as man, was a totally unpretentious being. 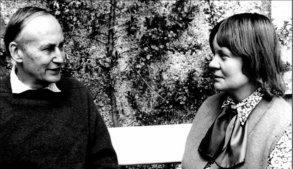 His work, seemingly simple, gives to us that shock of beauty which shows how close, how in a sense ordinary, are the marvels of the world” - Iris Murdoch from her memorial address 1979. JANET STONE Janet Clemence Woods, was born at Cromer, Norfolk on the1st of December 1912 and died on the 30th of January 1998 in Salisbury, Wiltshire. A descendant of Elizabeth Fry, the prison reformer, Janet Stone came of an ecclesiastical family (her father, Edward Woods, was Bishop of Croydon and then of Lichfield; one of her brothers, Frank, was Archbishop of Melbourne, another, Robin, Bishop of Worcester). She shared the qualities which singled her father out for church leadership - a good-tempered, gregarious nature, personal magnetism, organising powers and a strong, melodious voice. So fine a soprano was she indeed that for three months, early in her marriage, she trained as an opera singer under the famous Italian teacher Miele, who gave her free lessons because he believed her to be better equipped to sing Verdi than anyone he had ever met. But the training separated her too much from her husband and her household, which had become the centre of her life. Her decision to give up her musical career was a loss to opera but not to British cultural life, for her creative energies went into making a perfect environment where some of the best British artists and writers came to work and to relax. With her social curiosity and zest for life she had immediately increased their circle after they married, drawing in the many clever and talented people with whom her husband came in contact, but was too shy to entertain. This led to some notable collaborations - such as his illustrations to a selection of Benjamin Britten's songs, his dust-jackets for the books of Iris Murdoch and Cecil Day Lewis and his watercolours and engravings for Another Self and Ancestral Voices by James Lees-Milne. The stream of guests in summer brought Reynolds a large number of close friendships, such as he had never enjoyed before. Janet Stone was in a long line (now extinct) of Victorian and Edwardian hostesses that included Julia Margaret Cameron, Blanche Warre-Cornish and Mrs Leslie Stephen, whose cultured gatherings represented a higher peak of English civilisation, despite their modesty, than did most of the grand aristocratic establishments of the period. At Litton Cheney with the Stones, it was easy to believe oneself a hundred years back in time: there were fires in every bedroom, readings aloud round the drawing-room hearth in the evenings, lunch in a little arbour of Janet's design, picnics in high summer on the deserted Chesil beach, winding walks through a woodland garden full of rivulets and small bridges, and, amazingly, butter from their cow (and churn). The company, whether it were John Betjeman, Sidney Nolan, L.P. Hartley, Henry Moore or Frances Partridge, was always entertaining. One might say that Janet's motto was, "If a thing is worth doing, it is worth doing by hand"; and such perfectionism was pursued on a very modest income and with the assistance of only one devoted helper in the kitchen. Janet Stone was a romantic with a strong element of fantasy in her make-up, which did not clash with her practical abilities. Her handsome and stylish appearance recalled the Edwardian age. With her wide-brimmed hats and veils to protect her delicate skin, her corn-coloured hair and upright carriage, she made a memorable impression. Her conversation was ardent, emphatic and humorous. For all her enthusiasm for making new and illustrious acquaintances, she was unexclusive and was devoted to the many young people who came to stay and were bewitched by the demi-paradise that she had created. Surprisingly, despite her galvanising presence, she was not self-confident. She depended absolutely on her husband and after his death, in 1979, she gave up the house and entertaining on the same scale. Without Reynolds, life in Litton Cheney was unbearably lonely. Her life and home with him are commemorated in her photographs, some of which have been published in her own work, Thinking Faces (1988), others of which were commissioned for books and magazines; she took the author portrait for Kenneth Clark's 1969 book-of-the-television-series Civilisation. A collection of her prints is now in the National Portrait Gallery archive. She worked almost entirely in black-and-white. Most of her best portraits were done at Litton Cheney, with one of her three cameras, a Canon, a Yashica and an old Rolleiflex, the product of hours of patient observation. Some have an extraordinary spiritual depth - such as those of Iris Murdoch, David Jones and John Piper - as beautiful in their way as those of the four Stone children taken in childhood and youth; and humour runs through many of her images - of John Bayley, Professor of English Literature, lying happily asleep on a railway line; and of John Sparrow, Warden of All Souls, reading absorbedly, with a teacosy on his head. FUNERAL ADDRESS – Wednesday, 2 nd May 2012 By J. David Kennard (Major Retd. Irish Guards – Son) Colin David Kennard, much loved husband, father, step-father, brother, uncle, grandfather, cousin, godfather and good friend. What does one say in just a few minutes about a man who was, at just the age of 23, recommended for a Victoria Cross? Who was this man and what did his life mean? Beneath an endearing modesty, self-deprecating sense of humour, keen sense of fun, was a man of many talents and dimensions. A man who was respected and loved by his friends and family and those he led. He was loved for what he was and what he stood for during his long and full life. I have been moved by the letters sent to me, and they express over and over again “his bravery, inspiration, leadership, fun, modesty, kindness, determination and many other compliments. A close friend wrote, “He had an internal vibrancy and straightforwardness; a genuinely good man – a charming host”. HOME AND EARLY CHILDHOOD In his childhood, he lived in beautiful and interesting homes: Corton Denham in Somerset; the Old Bell House, and Purslow Hall in Shropshire. Early life was idyllic as the second youngest of five rumbustious siblings. Country sports were the main recreation with hunting and shooting being the most popular. Both his father and mother came from large families themselves and so there was no lack of cousins with whom to have fun. He and his younger brother Bob, were often packed off by train with luggage labels attached to their lapels, to stay for weeks on end with their Colfox grandparents and cousins in West Dorset. I even found recently, one of these labels, which described the boys as ‘goods’ to be ‘delivered’ to the Station Master! These halcyon days left my father with an abiding love of West Dorset where he felt completely at home. GROWING UP For a person blessed with a strong independent streak, life at prep school at Chafyn Grove, Salisbury, and then Radley College, was considered irksome and constricting. His main outlet for frustrations was on the rugger field where his competitive spirit was given full rein. He was always impatient for the holidays, particularly the winter holidays, so that he could go off with his gun and his dog, an assortment of brothers and his father. From reading his game book, it reveals that they managed to go out most days! One particular story comes to mind of this period. His elder brother Michael was a notoriously poor shot. One evening before a day’s shooting, my father and his partner in crime, his younger brother Bob, removed the shot from all of Michael’s cartridges and then refilled them with pheasant feathers. During the first drive the following day, as the duo watched with anticipation, Michael fired, missing a passing pheasant, but to his astonishment and disbelief and to his brothers’ unbridled mirth he was submerged in a deluge of feathers. Gleeful cries of ‘Good Shot’ echoed across the field. From Radley, in 1938, he went up to Christ’s College, Cambridge to read Land Management. WAR Like so many of his fellow students, he joined the local territorial regiment on the outbreak of war in 1939, but fearing that he would never see active service, he decided to join the Regular Army, but which regiment? His father’s advice was to join the Grenadier Guards. This was not a good move. He was turned down by that Regiment’s Lieutenant Colonel, partly because his younger brother Bob, had already been accepted by them a few weeks previously. In a moment of inspiration, he sought a recommendation for the Irish Guards – the Micks - instead. As he told us years later, what on earth was he going to say to his father for having been turned down by the Grenadiers? Two or three good friends had already joined the Micks and had not been at all reticent in their disapproval that my father should be considering a rival. In spite of the irregularity of this procedure, the Grenadier Colonel found himself agreeing to this. The subsequent interview with the Micks, was hardly an interview at all, so taken aback were they by his audacity. He was ordered to report to Sandhurst without delay. Like so many of my father’s generation, he rarely talked about the war. One or two amusing anecdotes percolated out during our childhood but he did not dwell on his personal exploits which happen to be well documented. My father was very modest about his achievements, he always believed that many others deserved greater recognition than himself and that so many ‘acts of bravery’ happened because of the accumulated deeds and common endeavour of many. He was one of the lucky ones who survived active service in North Africa, Italy and the advance through Holland and Germany. Amazingly, as a young officer in North Africa, he managed to survive, albeit wounded, a particularly brutal five-day battle on the ‘Bou’, against overwhelming odds where the Battalion was decimated. Of his original Company, only a couple of dozen Irish Guardsmen survived that battle. It was for this action that he was recommended for a Victoria Cross but was awarded an immediate DSO. It was only in recent months that he talked in any detail about these wartime experiences, dwelling somewhat on the utter futility of war and the waste of young life. All his life he mourned especially the loss of two close friends, John Kennedy and George Ismay. It is true to say, that the intense camaraderie born of these events left its mark on those survivors but inculcated an especially strong sense of ‘family’ in the Micks which is nurtured to this day. My father always considered the Micks his Second family and he rarely missed an Irish Guards’ party. However, not all his experiences in North Africa were unpleasant. There is an entry in my Father’s game book for 28 th March to 12th April 1943 at Medjez-el-Bob (Tunisia), just before the ‘Battle of the Bou – hills 212 and 214’ - and I quote, “Place: Medjez-el-Bob whilst in front line. Guns: self. Partridges – 15. Hares – 2. Remarks: sport somewhat hampered by heat and proximity of Germans. 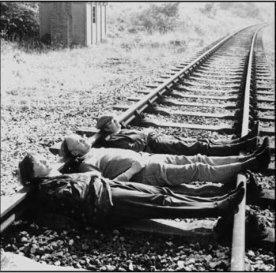 Birds very tough eating!” POST WAR On demobilisation, like many of his peers, he decided not to return to Cambridge thinking that too much had happened and that he was, at the age of 27, too old. He ended up in the City working for United Glass Bottles. It was a job, but not one that he relished particularly. For relief, he played rugger with passion and commitment for both Wasps and London Irish and was even offered an international trial for Ireland which he turned down as he did not deem himself to be Irish enough! DORSET In the mid ‘50s he grabbed the opportunity of moving himself and his family, having married my mother Rosemary in 1947, to Dorset to become the Sales Director of Joseph Gundry in Bridport, the largest net making firm in Europe. This got him back to the country and we lived in various houses: Wytherston, Symondsbury with the cousins, and Drimpton, before eventually settling in Litton Cheney where he soon became a stalwart and then leader of the Parish Council. These were happy years and one of my abiding memories is of being dragged round every point to point and racecourse in the West, come rain or shine, following my father’s other passion, the Turf. Picnics galore, put together by our long suffering Mother and, as my sister Clare and I got older, generous quantities of Gin and French of lethal strength were packed into the boot of the car and which were disbursed liberally to our friends along with tips on what to back. He was the most generous of hosts. Whenever I appeared at home, usually accompanied by numerous brother officers from the Mick or Celtic fringe, possessed of powerful thirst and hunger, my mother emptied the fridge and my father the cellar while the washing machine churned away. As my father got older, playing tennis became his twice-weekly activity. He was no mean player and only ceased playing in his 80s! He indulged too, his love of the racehorse by having minor interests in the odd horse, along with Nigel Martin of Came and Joan Turner of Cheselbourne, amongst others. What fun they had following their equine children’s racing progress. In the mid ‘70s, he left Gundrys, to become an independent stockbroker. He was in his element: bringing him into contact with people and looking after their interests, along with using his aptitude for figures. He built up a good business and was pleased when I decided to join him in the mid 80s. LATTER YEARS His marriage having failed at this time, he married secondly, Hillary, and acquired two stepsons, Edward and Colin. He made his home in Hinton St. George where he was very happy for the last twenty years or so. His increasing years and latterly, arthritis and cancer, were borne with typical stoicism and lack of complaint. As long as he had his gin, his racing, his whisky, his After Eight mints, his hotline to his bookmakers - plural, he was as content as he could be. His last year of life was spent in Abbey View Nursing Home in Sherborne where the care was excellent. He always looked forward to hearing news of, and having visits from, his five grandchildren of whom he was enormously proud. Underpinning his life was his understated acknowledgement of his spirituality. Like most English men of his era, this was worn lightly but I know that he talked with, and to, the Almighty on a daily basis. We loved him dearly, we shall miss him sorely but we know he is in good Hands. QUIS SEPERABIT.